These comments make it all worthwhile! "Funny little story -- This past Christmas, my husband and I both "surprised" each other with one of your little paintings. We both love to look at your website, and so I guess we each had the very original idea to purchase one of your paintings. You should have witnessed the scene on Christmas Morning. We both sure were surprised! :) And happy!" "The painting came today and it is already beloved. Many, many thanks." "I love seeing your paintings almost everyday via email, you are such an inspiration." "Deborah, my little painting looks wonderful in my living room!" "This is such a wonderful painting, it would make Edward Hopper proud." "Love love love it all, especially the lilacs." "Just got the third one today - it is perfect! Thanks again for all your beautiful work." "I just love your sense of brush stroke, eye and love of color!" "Thanks again for your lovely work- it adds a whole new level of personalization and warmth to our home." "I am becoming quite a collector. Thanks for the beautiful paintings." "Love it! We absolutely love it!! We are so excited to have this little collection in our house." "We have already received both paintings! Both of them are amazingly beautiful -- my husband has really been captivated just as I was." "I received my painting and it is adorable." "Always looking forward to your next painting!" "A piece that works on many different levels." "She complimented me on your paintings yesterday, so this is for her." "I'm a sucker for all your stuff. Wish I could buy a dozen or so." "I love your landscapes, we took a trip to California last summer and travelled through some of the areas that you paint, it was breathtaking." "Hi Deborah, I just wanted to let you know that, as a gardener, this painting captures the vision of a perfect place for me. Thanks for this glimpse of garden perfection!" "I was born in California and spent most of my life there, so your work enhances my memories. But I love all the paintings, they could be on the moon and I'd love them." "WOW! Different style, but very nice!" "I will keep my eyes on your coming work." "Hi Deborah, What a nice painting! It was packaged so nicely. I will enjoy it!" "Deborah, I simply love them. They perfectly arrived last Thursday. As things are slightly hectic I’m able to look at your paintings and feel totally better." "You have truly captured the essence of the iris. I love it." "I've had it as my desktop background on my computer for several days. it was seeing it every day, bigger than the view I get when visiting your web galleries, that made me want to have it. It has such great charm." "This is great and the cars are appropriately rendered. I love it!" "Your paintings are absolutely enchanting, so inspiring!! Especially love the Lady Banks paintings!" "Hi Deborah, We will be going to Bodega Bay on Easter Sunday in search of the spot where you painted the beautiful "Above the Estero"." "Your San Francisco paintings touch a soft spot in my heart!" "Thanks again for doing the painting. Wonderful." "Hi Deborah-I am sure enjoying my new painting." "Just wanted to thank you, I simply love your paintings, they are "all" stunning." "They arrived safe and sound yesterday. Thank you." "We really appreciate the new art. It makes the place so much brighter!" "I've been cursing myself for missing the one of the sailboats, and prior to that the umbrellas at the beach. You have a wonderful sense of color." "That is gorgeous. I love my little painting more and more each day." "My parents LOVED the Donner Lake painting you did (we gave it to them as a gift)." "Hi Deborah, I was looking at your new paintings and like always I like them all. I enjoy very much the ones I purchased." "Hello Deborah, My wife and I purchased another of your paintings at Christmas time (I believe it was Vineyard #2) and loved it so much that we didn't give it as a present as we had planned." 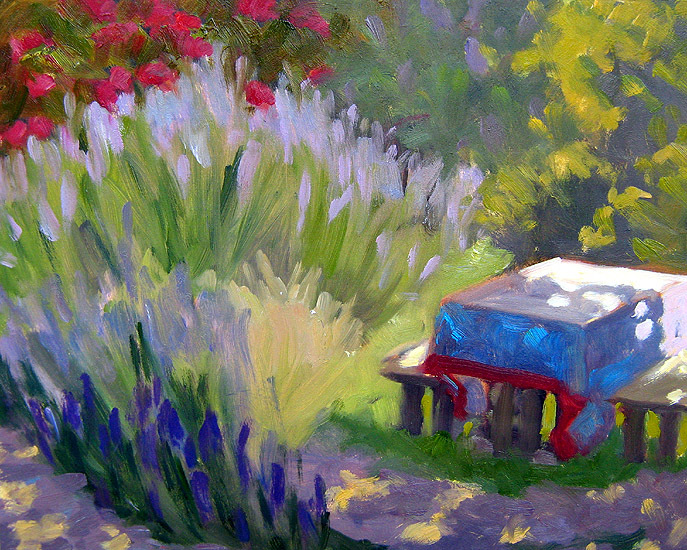 "Deborah, I so envy your quick, bold, richly colored style. Thanks for your great, inspiring website." "The light in my side room is perfect for it. It is lovely." "I got the three paintings yesterday. They're really nice. Im looking forward to the fourth." "The paintings arrived safe and sound today. They are beautiful!! Thank you so much." "WOW... I can't wait. Happy Birthday to Meee. Thank you so much. I'll let you know when it gets here." "I am so excited and proud to have one of your pieces!" "Deborah, I look forward to "growing" up to your larger paintings someday. And I hope to send you a photo of my "Cushman Gallery" once I've installed your series of little paintings in my hallway." "Hi, Deborah. I can no longer resist. Actually I like just about everything and wish many others were still available." "I loved looking at your beautiful scenes, colors and composition. I'm looking forward to having the real deal on the wall." "Hello Ms. Cushman: I was showing the house today, and received lots of compliments on your beautiful 3 panel valley rendition. We enjoy looking at that piece every day we are here. Thank you again for your beautiful job!" "We are really enjoying looking at the paintings here and waiting eagerly to add the others." having your painting to remember our trip by." "Your work is just beautiful, and fantastic. Colors and compositions. Wish I had about 10 just to look at in my office." "Beautiful day, and beautiful subject. It is interesting to see your work in this context. Thanks for sharing, Deb." "It is 6 degrees out. Your two paintings hang in my living room. You are wonderful and I thank you so very much!" "Hi Deborah, You are kind to respond so quickly. I'm very excited to have your artwork in my home." "I'm in love with your small painting series. I grew up in Manhattan Beach and I love how you captured the place where I lived for 30 years." wonderful!! Thank you sooo much!" "Thanks so much for your kind message, Deborah! It means a lot coming from a fellow artist. Your little paintings are hanging in our entry way, and we've received many compliments on them." "I received the painting, and I love it! Thanks so much-"
"I love the new painting in yesterday's e-mail!! Glad to see it sold so quickly, otherwise it would be haunting me!!!" "Thank you for the fast reply and I'm so happy about my little painting!" "I cannot wait to receive my painting! It was so hard to decide on just one." like how the small format emphasizes the freshness and painterliness of your brushstrokes. Not to mention your sense of composition, your use of color and value, all in the expression of your relationship with the landscape." "I've received it and love it very much. Thanks." "I am so excited about finally having your work in my home! I want you to know that I look forward to your emails every day. When I have had a busy day, a stressful day and yes, even a wonderful day… I cannot think of a better way to end the day than by looking at what you have painted and shared with all of us." "OMG! gorgeous gorgeous paintings!!! Love your work, just wanted to let ya know!" "Wow, I wish I could wear this! They are soooo my colors!" "I received your little paintings yesterday and was very happy with them." "Wow, I bought it before the paint dried - cool!" "Your pumpkin patches are beautiful! I really like them both." "I'm home and already enjoying my new painting!" "I have one of your paintings in my bedroom that I look at every day and love." "Hello, Deborah! I just came across your "Little Paintings" on the internet. They are so gorgeous! I am ordering two as a birthday gift, but I just wanted to say how appealing I found them and also how much I appreciated your frank and unpretentious way of writing about your work. So many of your images rang bells! I love the colors and fresh and easy way of rendering a scene." "Thank you for your speedy response. The colors are just delicious and your brushwork is amazing!!!" "You are prolific! I got the painting yesterday and it looks great! Nice job of packaging, too, btw. Thanks-"
"What a breath of fresh air! Thank you for your inspiration." "Love the beach scenes! I grew up in Huntington Beach, so seeing the lifeguard stations and umbrellas warm my heart, literally." "Once again, thank you for your work. Your paintings touch me." "Deborah, I've been meaning to say how much I enjoy your paintings and the option to buy them so conveniently. Who knew I was attracted to California palm trees? I'm so grateful I found your website." "I would like to confirm my purchase of the painting to make sure no one else purchases it! I really like your interpretation." "I love the paintings. Both arrived safely this week. I am so happy with them. Hooray! Thank you for leaving on the price tag from the gallery." "Hi Deborah, I just wanted to let you know that my husband was very touched by the paintings and thanked me for getting them." "Deborah, I have received the paintings here in Canada, and they look great!" public. We appreciate your fine work." "Thanks so much! Your paintings make me want to travel up the coast." "I just love both of the little paintings. I love the mood of each and can't stop staring at them. I've hung them so that they are like little windows to look out on things I love to see." "Hi Deborah! Your painting arrived today--it's just beautiful. Thanks so much for doing this for me and for sending it along so promptly. It's just great." "Hi Deborah, I enjoy your work and really appreciate the great service. You are a real talent!" "Deborah, Love it! Particularly the layers of colors and the deep field of vision." "Hi Deborah, The painting is now snuggly hanging on the wall and we have been enjoying it since the moment it came. Thank you." "So much for my new self-control!!!!!!!! I LOVE the rooftops and the dark skies and the headlands. It's gotta be for me. I wonder if there is a load-limit in my second floor condo??????"